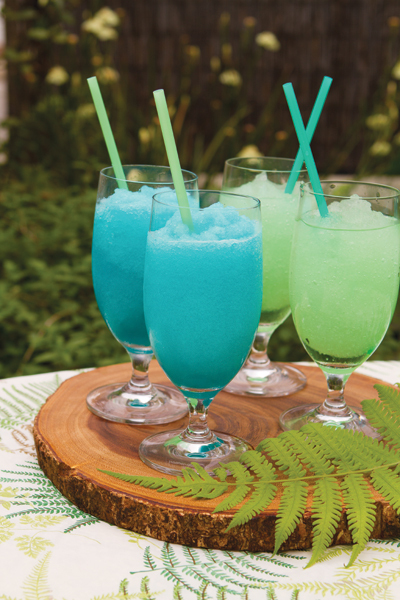 Beat the heat with a cocktail hour, complete with tasty beverages and simple snacks. During the summers of my childhood, the highlight of many hot afternoons was sipping homemade lemonade, root beer or tea. What fun we had under the oak trees at Aunt Belle’s, slurping beverages chilled with ice that had been crushed by beating ice cubes wrapped in a towel with an old hammer! These days, what with the plethora of bottled, canned and ready-to-mix drinks on the market, half the fun – gathering ingredients and making the concoctions – is gone. With the summer stretching before me, nieces and nephews, some of them with their own young children, are already calling me to set aside some time to spend in my tree-shaded yard with plastic swimming pools. So I’m gathering some old-time drink recipes. Too, I’ve decided that late afternoons on these long summer days are perfect for inviting the neighbors over for a cocktail hour now and then. Mama and Papa often had impromptu get-togethers years ago on their cool, lush patio, and I thought that was so civilized and pleasurable. You might want to do the same! Don’t forget to include some munchies. Let’s begin with the nonalcoholic beverages. Combine the tea bags with 2 cups of boiling water, and steep. Discard the bags. Add the sugar, and stir to dissolve. Add the fruit juices and grenadine. Chill for several hours. When ready to serve, add the chilled ginger ale. Serve over ice, and garnish with a sprig of mint. Serves 8 to 10. Combine the water and sugar in a large saucepan over medium-low heat. Stir to dissolve the sugar. Add the remaining ingredients, stirring until the grape concentrate is completely melted. Pour the mixture into freeze trays or a plastic bowl. Freeze until firm, stirring several times during the freezing process. To serve, scrape the ice with a large spoon and serve in small bowls. Serves 6 to 8. And now on to adult beverages! Blend all of the ingredients in a blender until smooth. Serve in a tall glass. Serves 1. Blend all of the ingredients in a blender until smooth. Pour into a tall glass to serve. Serves 1. Combine all of the ingredients in the blender, and blend for about 15 seconds. Serve in cocktail glasses. Serves 4. Munchies can be as easy as chips and dips, crackers and cheese or finger sandwiches. Combine all of the ingredients in a mixing bowl, and mix well. Store in an airtight container in the refrigerator until ready to use. Best when used within 24 hours. Serves 2 to 4. This curry dip is great to serve with boiled and peeled shrimp. Combine all of the ingredients in a small mixing bowl, and whisk to blend well. Store in the refrigerator in an airtight container for up to three days. Makes about 1 cup. During the summer, I love homemade pimento cheese to serve on crackers. Combine all of the ingredients in a bowl, and mix well. Cover, and chill until ready to serve. Makes about 2 cups. In my book, there’s nothing better than chicken salad sandwiches. Chicken salad is ideal for making finger sandwiches, plopping on the top of thick slices of Creole tomatoes or stuffing into half an avocado. This one is a classic. Put the fryer in a large, deep pot, and cover with water. Add the carrot, celery, onion, bay leaves, peppercorns, salt and parsley sprigs. Bring to a boil; then reduce the heat, and simmer, partially covered, until the meat begins to fall off the bones, about 1 1/2 hours. Remove the fryer from the pot, and strain the broth. (The broth can be cooled and stored in containers in the freezer to use for soups.) Let the chicken cool, and then pick the meat off the bones. Coarsely chop or shred the chicken. In a large mixing bowl, combine the chicken with the mayonnaise, eggs, lemon juice, mustard, celery, parsley and sweet relish. Season with salt and pepper. Toss to mix well. If you like it a little moist, add a few tablespoons of the reserved chicken broth. Cover, and chill in the refrigerator for at least 1 hour before serving. Serves about 6.